Shane O’Neill, also known as Shane Shane, describes himself as “a performer, homosexual and video artist living in Brooklyn.” He hosts an a la carte variety show called Tonight’s Special, in which audience members choose their entertainment from an “artisanal, seasonal menu” of jokes, stories, songs and videos, most recently at UCB East. With Jill Pangallo, he created the characters Jane Johnson and Pam Weldon, midwestern musical icons from the Stay At Home Shopper Network. Catch them at Joe’s Pub on April 10, 2019 in a brand-new show called The Jane Johnson Convention, featuring live calls, special guests and more. Shane also makes videos for The New York Times! Yes, THAT New York Times! Follow him on Twitter and Instagram. You can also follow Jane Johnson @RealJaneJohnson and check out Jane and Pam’s weekly vlogs on YouTube! Cat Quiz: How Much Do You Know About Parties, Clubs and Creatures of the Night, By Which I Mean Cats? [Cat Quiz Spoiler] More about Warhol’s cats, and some of his original drawings. In this edition of Hey, You Need A Cat!, we address actual human-feline Sandra Bernhard, whose dog George is admittedly adorable. Plus! Shane has some insider intel about George’s walker! 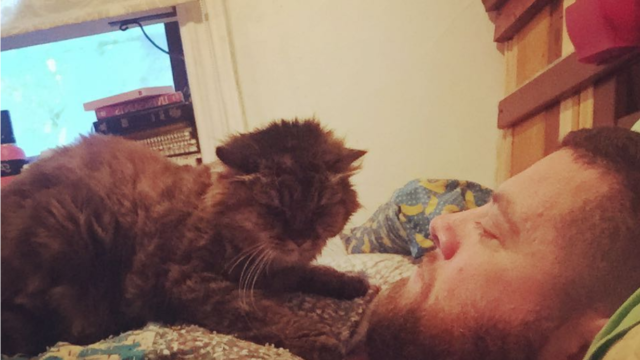 The tale of Booger, the crust-punk kitty who introduced Shane to the world of cats! After Hurricane Katrina, a gang of kittens left New Orleans and boarded a bus for the Midwest, where one of them found the love of her life (Shane). Then Shane moved to New York for art and love… but the man he loved hated cats. Could one beautiful feline (Wanda) thaw his icy heart? Uh, what do you think? New York, New York: the city so nice, its residents think nothing interesting happens outside it! We ended up talking about creative communities, subcultures and why they mean so much to us—as cat people, and as people who sometimes wonder where or if we belong.